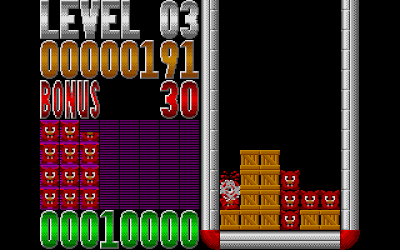 Possibly inspired by a fairly obscure Japanese arcade game from 1992 called 'Cosmo Gang The Puzzle', Buzzsaw is a variation on the Tetris premise of arranging falling blocks to complete lines, but with the addition of cute baddies that get in the way of actually completing those lines. Each block that drops is the same basic shape – just three tiles in an 'L' shape. 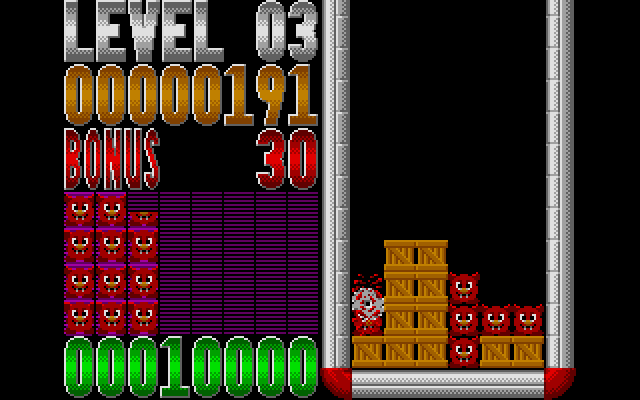 If all three components were always crates (the default block) then this would be the most trivial Tetris variant ever – but instead some tiles in these blocks may be replaced by the aforementioned baddies, or weights that crush baddies. 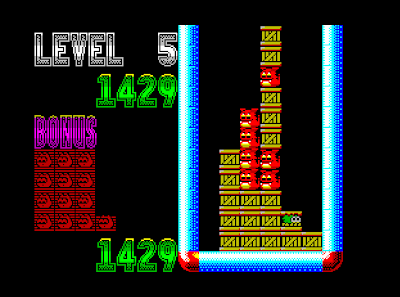 The most spectacular variant, however, is when a tile is replaced by the titular Buzzsaw. This is a circular sawblade that, upon being placed, carves through any baddies below it, and then skips off to the left or right (dependent on orientation) massacring any baddies in the playfield it gets to. Placement of the little critters is thus crucial to allow them to be Buzzsawed later - and at faster levels this game becomes a hectic juggling act, exactly as one hopes of this sort of action puzzle game. If considered in a vacuum, this game would be a fine example of its genre, playable, nicely presented, and accommodating - with the ability to start on different levels, redefine keys, and configuring correctly regardless of the particular model spectrum it is playing on (or is being emulated). 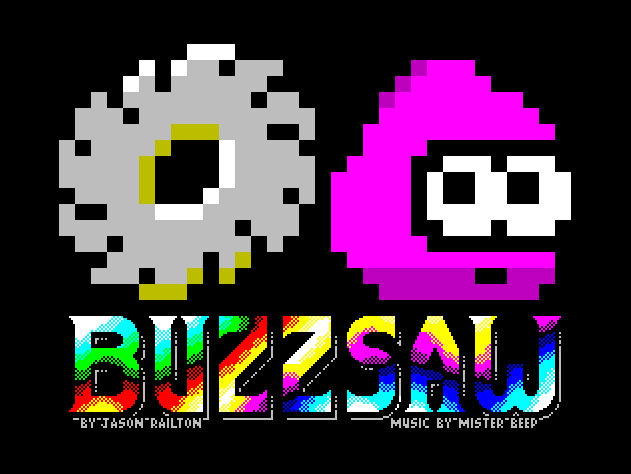 A great musical theme on the title screen by Mister Beep adds to the overall gloss. When considering this next to nearly every other ZX Spectrum game though, Buzzsaw is like watching a bewildering magic trick. The colours! 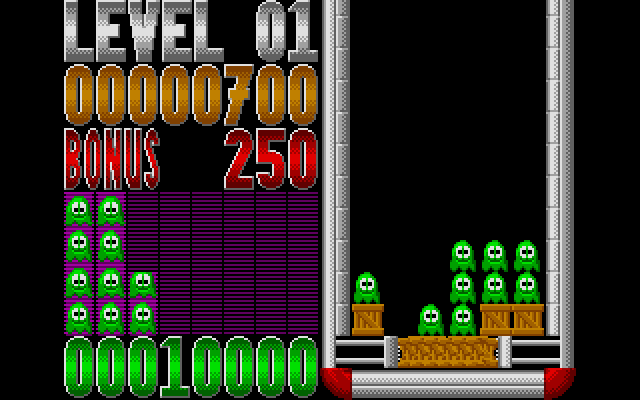 This game absolutely refuses to obey the 'two colours per character square' rule that defined the look of Spectrum games since time began. Had Jason Railton released this in 1984 he would have either been revered as a programming god, or burned at the stake as a witch. Yes, there have been selected examples of games that exploited clever timing of colour changes within the raster scan beam to do these kind of effects, but usually these are reserved for menus, high score tables and the like. Not so here. 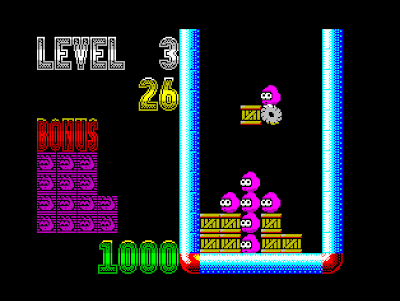 The colour trickery is rock solid throughout the game itself making an experience that just does not resemble a ZX Spectrum at all. Couple the amazing colours with the solid game behind it and you have a game that belies the hardware it is written on – thus an excellent game to rub in the faces of your C64 owning chums (if the playground feuds are still going on a quarter of a century later). An utterly essential download for the technical aspects alone, wrapped around a perfectly playable and fun (but probably non-essential) game. It should be noted that the 'Foxton Locks Mix' reviewed here is the free version of the game, and Jason should be releasing a slightly modified version (Box Deluxe Mix) through retro publisher Cronosoft in the near future. Whilst reading the game's documentation on World Of Spectrum I noticed that Jason referred to an 'original Atari ST version'. Now, I've been following the Atari scene since I was a kid and I'd never seen or even heard of this game before - and neither had any of my scene contacts. So I dug deeper. Atari Legend? No mention. Little Green Desktop? Likewise. Google? Nope. Finally, after discussing the game with Jason on the OSG forums I managed to obtain a copy of the ST version (which has been hiding away on an obscure Atari programming group disk all these years) and after a bit of tweaking it was up and running on my Atari STE. Coded in STOS, gameplay-wise Buzzsaw is near identical to the Spectrum version. Visually it's a bit rough in comparison, but even so, I can't help feel that if it had been given a proper public domain release back in the 90's Buzzsaw would have been really popular. It just goes to show that even today, the occasional GEM (pun intended) can be unearthed from those crusty old forgotten group and fanzine disks. As it's pretty hard to find out there in the wild, Jason has given permission for RGCD to host a copy of the original Atari ST program (complete with documentation) and a fixed TOS 2.06 version on our server. Download the Atari ST version of the game here (from the RGCD server). Run it using STEEM (freeware). 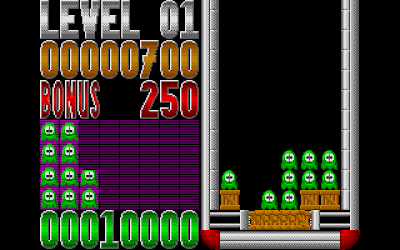 If you like this sort of game, then the Super Nintendo's Pac Attack will be right up your street - the baddies are the ghosts, and Pac himself becomes the "saw".